That is hardly the person you should defer to in matters of style or fit. 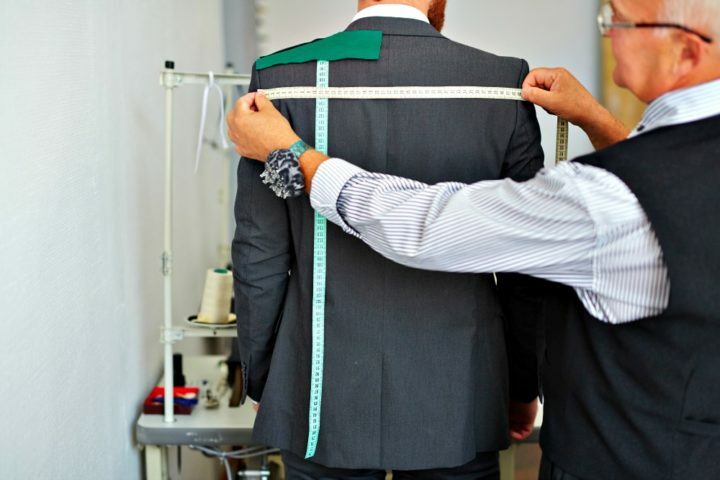 Well, here is the good news: The science of the correct fit for a suit is not as difficult as you may think. This is definitely something that can be learned. While a man’s suit is made to fit a standard form, very few men can slip on a ready-made suit and find that it needs no alterations. 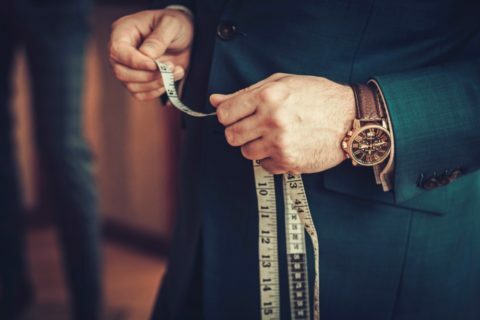 So, the more knowledgeable you can become about how your clothes should fit in relation to your body’s frame, the more likely you are to have a well-balanced, tailored result. The following steps are what you should expect when being fitted for a suit and what you should request in order to leave with an elegant, tailored finish. Arrive well dressed. It sets the tone of your expectations from the start. Bring or wear a well-fitted dress shirt with correct sleeve length and collar height. Wear dress shoes with proper heel height for correct length and bottom width. The tailor should begin the suit’s fitting from the top and work down. The shoulder’s width or point-to-point needs to be wide enough to allow the jacket’s fabric to drape from the shoulder in an unbroken line down the entire sleeve. There should be enough fullness across the back and chest so the lapels lie flat without gapping open. There should be sufficient fullness over the shoulder blades for a slight break — extended up the back, starting at the bottom of the armholes. These slight breaks provide enough room for ease of movement and comfort. The collar should not stand away from your neck or have horizontal ridges below the base of your neck. If they appear, request that the collar be lowered by cutting away the excess fabric under the collar. If tension lines are visibly pulling across the shoulder blades, the back is too tight and must be let out. In order for the jacket collar at the back to hang correctly and look its very best, make sure that at least an inch of shirt collar shows above it. The waist should be comfortably suppressed to the natural frame of the body. If X-shaped lines appear on either side of the jacket’s fastened waist button, the waist should be let out. The back vents should hang in a straight line perpendicular to the floor. When buttoned, you should have enough room to sit down comfortably. The jacket sleeve should extend to where the wrist breaks with the hand. Short arms should allow for a 1/2-inch of shirt cuff to show. Long arms should allow 3/4-inch to 1-inch of shirt cuff to show. Details like this define the well dressed man. Place them as high on your waist as comfortable. Placing pants on hips make the crotch hang too low and look sloppy. Plus, it spreads the pockets and pleats. Like the armhole of a jacket, the trousers’ rise should fit as high as comfortable in order to provide ease of movement. With pleated trousers, the hip and thigh must be full enough for the pleats to lie flat while standing. If trousers will be worn with braces (suspenders), the pants must be fitted with them. Trousers that will be worn exclusively with braces should allow for 3/4-inch to 1-inch more in the waist — so they can “suspend” from the shoulders. The length of the trousers should allow for a slight break on top of the shoe. When in full stride, your pants should be long enough to cover your socks and wide enough to cover your shoelaces. With plain bottom trousers, you should request a slant hem 1/2-inch downward from front to back so they remain at the heel when walking. Cuff size should be 1-1/2 inches for men under 5 feet, 10 inches, and 1-3/4 inches to 2 inches if taller than 5’10”. Thankfully, independent tailors (quality tailors in better men’s stores as well as personal clothiers with sound professional advice) can still be found. When they are found, they should become your trusted companion.